Also known as: Chamomile, Chamomel, Maythen, Whig plant, Earth apple. A low growing hardy plant with white daisy -like flowers. When walking on the plant it gives off a strong fragrance similar to apples. 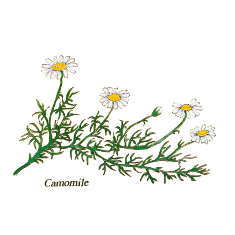 Chamomile has long been known as a useful herb because of its calming and mild sedative affects, aiding with stress, anxiety and insomnia. It can be effective in helping indigestion and colic. It has been said to relieve the pain of period cramps and symptons of pre-menstrual tension, as an oil it can act as an anti-inflammatory, cooling and calming and as an ointment is often used for skin conditions and nappyrash. 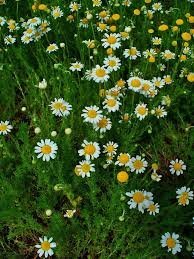 Chamomile has been used as a remedy for stress and for its calming properties since ancient times, known to have been used by the Egyptians and the Greeks.